Endurance, strengthening, stretching and flexibility all are important parts of playing any aerobic type sport such as basketball. Close games are won late in the game often by the team with the best physical conditioning. When you are tired, your shots come up short, you miss your free-throws, your defense, hustle and rebounding suffer... and these are the things that win games. If you are a quick, full-court pressing and fast-breaking team, you must be in top physical condition and you can win against more talented teams by pushing them to their point of fatigue. Ideally, the conditioning process should begin before the season starts, as each serious-minded player should come to the first practice already having begun his/her conditioning at home a couple weeks before practices begin. A home program can involve stretching exercises, home strengthening exercises, running distances and sprints and jumping rope (good for foot speed, coordination and endurance). 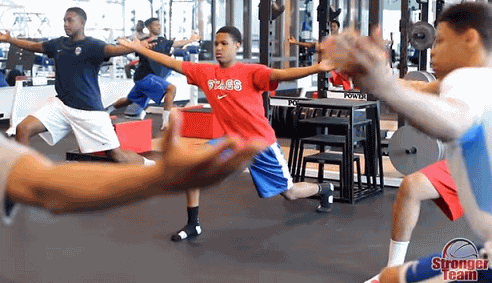 Once practices start, use a program of stretching, followed by running drills that stress aerobic conditioning. Finish with strengthening exercises or weight room work-out (two or three days a week). Players are stronger these days and this translates into confident, athletic teams that can rely on their strong rebounding, defense, and hustle to win many games. with Alan Stein, Professional Basketball Strength Coach and Head Strength & Conditioning Coach for DeMatha Catholic High School. Basketball conditioning expert Alan Stein stresses that being fit and being in basketball shape are two completely different concepts. Since the game of basketball is fast paced, intense and provides very few rest breaks - your team's conditioning workouts should reflect this. Additionally, basketball is very movement-specific, so it is important to have players' include sprinting, back pedaling, defensive sliding and jumping in their workouts. To keep the workouts fresh, innovative and on the cutting edge, Coach Stein incorporates a variety of audio and visual cues that help improve a player's ability to read and react. The drills shared in his DVDs are fun, interactive and competitive. In addition, each of these drills can be done for a desired time or a certain number of reps, and many of the drills can be done just about anywhere, which is of great value for coaches with limited court availability. Many of these drills are basketball-specific and will help your team improve moving without the ball, defensive positioning and rebounding, etc. Read "Vertical Jump Claims"... what Coach Stein says about products that claim to guarantee great (unrealistic) improvements in vertical leap. "Alan Stein's DeMatha Basketball: Warm-Up & Flexibility"
"Alan Stein's DeMatha Basketball: Agility & Conditioning"
"Alan Stein's DeMatha Basketball: Strength & Power"
"Alan Stein: Off-Season Training for Basketball"
ACL Injury Prevention for Female Athletes"
Many more basketball DVDs at the Coach's Clipboard Basketball DVD Store! This page lists a number of DVDs focused on conditioning, strength training, quickness and agility, and injury prevention. More basketball DVDs at the Coach's Clipboard Basketball DVD Store! This page lists a number of DVDs focused on plyometric training. More basketball DVDs at the Coach's Clipboard Basketball DVD Store! This page lists a number of DVDs focused on strength training. Complete Conditioning for Basketball by Greg Brittenham and Patrick Ewing. For a basketball conditioning program, exercises, drills, etc. Many teams run sprints ("gut busters", or whatever you like to call them). However, I believe that it is better to run specific conditioning drills using a ball, rather than just running sprints. If you are going to make your players run, have then do it with a ball... speed dribbling, dribbling moves, full court defense 1-on-1, etc. There are a number of great drills that combine conditioning and specific skills. 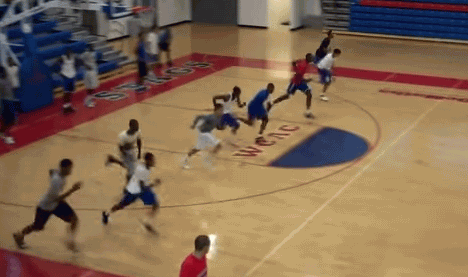 When you do these drills, your players will get tired quickly. When they are tired, let them catch their breath by having them shoot free-throws or work on shooting form to simulate the fatigue that occurs in a game situation. But be sure to start your practice with stretching exercises first, to enhance flexibility and avoid injuries. Below is a list of drills that are all excellent for aerobic conditioning as well as developing a specific skill. If you use the 3-man weave, the "piston" and "pitch 'n fire" drills, 4-on-4 transition, and the full-court dribbling drills, your players will definitely get an aerobic workout, and if you run some of these drills every practice, your conditioning will be much better. You can vary the drills from practice to practice. Make sure all drills are run with intensity and speed, no "dogging it". If you feel the team is loafing, stop the drill and as "punishment" (or motivation) have them each take a ball and speed dribble back and forth full-court several times (down with left hand, back with right hand). But don't go overboard... follow a high intensity aerobic drill with free-throw shooting or some other less aerobic drill, or even a "time-out", which simulates the rest in a game situation, to discuss or demonstrate some concepts of your offense, defense, etc. Also, when using competitive drills (where the losing team has to run a few sprints), instead of just running sprints, always have them take a ball with them and speed dribble back and forth, so they are working on dribbling as well as conditioning and their "punishment" (motivation).